Pairing high-waisted print shorts with neutrals - so hot - we love this look! Both celebs and the runways have been unleashing their wild sides with the animal print trend. It's not the first time this trend has reared it's head - wild prints are definitely roaring their way back onto the fashion scene with a vengeance! This trend never seems to go away, it just seems to peak. Be daring with these full on print dresses. Start small by adding print to your wardrobe through accessories and details. When we think animal prints, the first thing that comes to mind is leopard print. 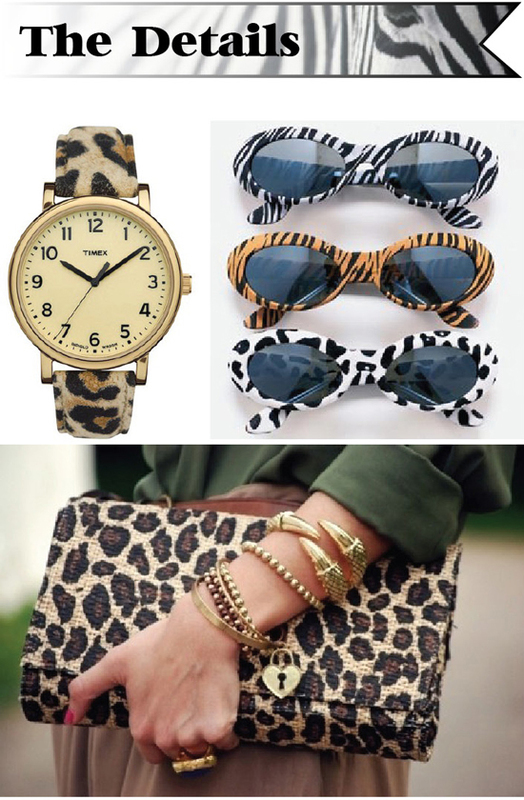 Love it or hate it, it's the trendiest animal print still chosen by most designers for their collections. It now can be found in a variety of colours, and along with the leopard we can also find the wildest zebra, snakeskin and crocodile prints for you to get your paws on. have a lot to do with it! Off to the gym we go! 1. Pair animal prints with bold, bright colours or with neutrals. Think hot pink or beige. 2. Remember that "tighter" prints like cheetah and leopard look great on most women, but larger scale prints like cow or giraffe have lots of white space in them and are more difficult for everyone to pull off. 3. Wearing animal print is calling attention to yourself - so be sure to wear the prints on your best features. That is, if you have a big booty, don't wear print pants. 4. If wearing a one piece animal print just isn't for you, and you want to start small, try a print clutch or belt to bring in the trend.